I created this Butterfly Effect Granny Square design to add to our 365 Days of Granny Squares project. It uses variety of crochet stitches to create a look of a 3D Butterfly! You can make this with two-toned wings or have the wings be one color! This square turned out to be a little larger (8 1/2 inches) but if you use a smaller hook this square may turn out to be 6 or 7 inches. I hope you enjoy making your square! -The finished square measures 8.5 inches. Beg. Popcorn: ch up 3, 4 DC in same st, remove hook from loop, insert hook in 1st st, put loop back on hook and pull through. Popcorn: 5 DC in same st, remove hook from loop, insert hook in 1st st, put loop back on hook and pull through. Beg. TR Popcorn: ch up 4, 6 TR in same st, remove hook from loop, insert hook in 1st st, put loop back on hook and pull through. Rnd 1: Beg. Popcorn in ring, ch 2, 3DC in ring, ch 2, 3 DC in ring, ch 2, Popcorn in ring, Ch 2, [3DC, ch 2, 3DC] in ring, ch 2, sl st to beg. popcorn. Rnd 2: Beg. Popcorn in popcorn, ch 2, Dc in ch 2 sp, DC in the next 3 sts, [2dc, ch 2, 2dc] in corner, dc in next 3 sts, DC in ch 2 sp, ch 2, Popcorn in Popcorn, ch 2, DC in ch 2 sp, DC in next 3 sts, [2dc, ch 2, 2dc] in corner, DC in next 3 sts, DC in ch 2 sp, Ch 2, sl st to beg. popcorn. Rnd 3: Beg. Popcorn in popcorn, ch 2, DC in ch 2 sp, DC in next 6 sts [2DC, ch 2, 2DC] in corner, DC in next 6 sts, DC in ch 2 sp, ch 2, popcorn in popcorn, ch 2, DC in ch 2 sp, DC in next 6 sts, [2DC, ch 2, 2 DC] in corner, DC in 6 sts, DC in ch 2 sp, ch 2, sl st to Beg. Popcorn st.
Rnd 4: Beg. TR Popcorn in popcorn st, ch 2, dc in ch 2 sp, dc in next 9 sts [2 DC, ch 2, 2 DC] in corner, dc in next 9 sts, dc in ch 2 sp, ch 2, Popcorn in Popcorn, Ch 2, DC in ch 2 sp, DC in 9 sts, [2DC, ch 2, 2 DC] in corner, DC in next 9 sts, DC in ch 2 sp, Ch 2, sl st to Beg. TR Popcorn. Rnd 5: Sl st into ch 2 sp after TR Popcorn, Ch 3, DC in same sp, DC in next 12 sts, [2 DC, ch 2, 2 DC] in corner, DC in next 12 sts, 2 DC in ch 2 sp, Ch 2, Popcorn in popcorn, Ch 2, 2 DC in ch 2 sp, DC in next 12 sts, [2DC, ch 2, 2 DC] in corner, DC in next 12 sts, 2 DC in ch 2 sp, ch 2, sl st to beg. ch up 3. Rnd 7: Ch up 3, DC in next 17 sts, [2 DC, ch 2, 2 DC] in corner. * DC in next 20 sts, [2 DC, ch 2, 2 DC] in corner, repeat from * 2 more times, DC in last 2 sts, Sl st to ch up 3. Rnd 8: Sc in each st around putting [2sc, ch 2, 2 sc] in corners. Sl st around a DC in a popcorn st from round 3 toward the bottom of the butterfly body. Row 1: Ch 4, sl st in both popcorn sts from round 1, ch 6, sl st in popcorn below the head. ch 1 turn. Row 2: [5DC, TR, Picot, TR, 9 DC] in ch 6 sp, sl st in next 2 sl sts, [6 HDC, 2 DC, 3 HDC] In ch 4 sp, sl st in ch 4 sp, ch 1 turn. Row 3: HDC in 11 sts, Sl st in next 2 sl sts, DC in 9 sts, [DC, Picot, DC] in picot, DC in next 6 sts and sl st in last st also. Fasten off with long tail. Sew wing down flat. Weave in all ends. Row 1: Sl st in popcorn st below the head. Ch 6, sl st in both popcorn sts from round 1, ch 4, sl t in popcorn st from round 3, ch 1 turn. Row 2: [3HDC, 2 DC, 6HDC] in ch 4 sp, sl st in next 2 sl sts, [9DC, TR, Picot, TR, 5 DC] in ch 6 sp, sl st in ch 6 sp, ch 1 turn. Row 3: DC in 6 sts, [DC, Picot, DC] in Picot, DC in 9 sts, sl st in next 2 sl sts, HDC in 11 sts, sl st in last st also. Fasten off with long tail. Ch 3, sl st in 3rd ch from hook, ch 3, sl st around Beg. TR Popcorn Stitch, ch 6, sl st in 3rd ch from hook, fasten off with long tail. Sew feelers down flat. In keeping with my costume theme that began with my Enchanted Rose Cape, I have finished designing Part 2: The Beast Hat. From the outside, he may appear menacing, but underneath is a heart of gold. He’s my perfect beast! This beast hat encapsulates the fierce persona that one would like to portray in this costume. If you are looking to do the Beast from Beauty and the Beast, this particular hat is just the right way to achieve that! Beyond the Beast, this hat has a lot of versatility! You can remove the horns, change the colors, change the ears to create your own adult hat in various animals such as a bear, a skunk, a panda, or the like. This is a very warm and heavy hat perfect for those winter days. Enjoy this tutorial and written pattern! -The pattern video tutorial starts at 9 minutes. The first 9 minutes are frequently asked questions and other information. 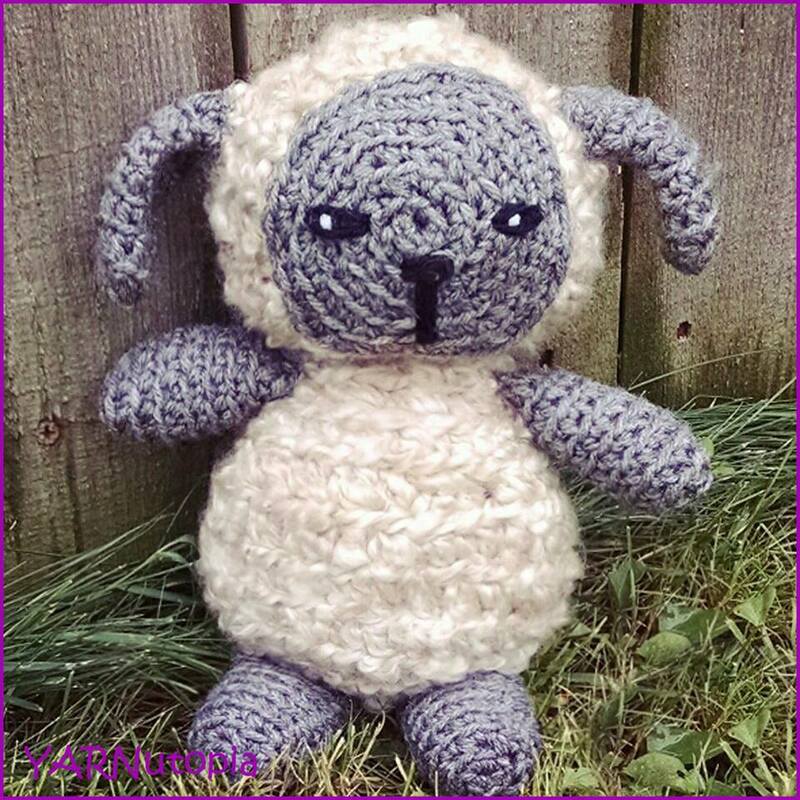 -You can use any bulky yarn or any furry yarn if you cannot find the Patons Theo yarn. -This pattern is written for an adult size, but if you stop increasing on rounds 2 or 3 of the hat, you could make this for a baby. Fold hat in half and make other earflap on opposite side repeating the same thing you did for first earflap. Add fur by single crocheting around the ear edge. Fasten off. Weave in ends. Or however long you need to make it. I created this Snail’s Pace Granny Square design to add to our 365 Days of Granny Squares project. It uses variety of crochet stitches to create a snail in a square! It’s for times in your life when you feel like you’re moving at a snail’s pace, but hey, at least you’re moving forward! I hope you enjoy making your square! -The finished square measures 6.5 inches. With color A, Ch 4, sl st to 1st ch to form a ring. Rnd 3: Put color B loop on hook, 2 B4 in next 14 sts, fasten off color B, pick up loop from color A, 1 HDC in next 21 sts, ch 4, sl st into 2nd ch from hook, sc in next ch, hdc in next ch, hdc around hdc post of previous stitch, HDC in the next 7 sts, LDC in next 4 sts from previous round, Ch 3, sl st into next st, ch 6, DC4TOG over Chain, sl st to the ch 3 that you sl st’d to the spiral. Fasten off. Rnd 4: Start in 2nd st to the right of the tail: CH 3, DC in same st, DC in next st, DC in the HDC that’s worked around the post (See video tutorial), [DC, ch 2, DC] in next st, DC in next 7 sts, [DC, ch 2, DC] in next st, DC in next st, HDC in next st, SC in next st, CH 1, DC in next st after the head, DC in next 3 sts, [DC, ch 2, DC] in next st, DC in next 7 sts, [DC, ch 2, DC] in next st, DC in last 3 sts. I created this In the Garden Granny Square design to add to our 365 Days of Granny Squares project. It uses variety of crochet stitches to create an interesting floral design! I hope you enjoy making your square! Rnd 1: Ch up 1, 12 sc in ring. sl st to 1st sc. Rnd 2: In any st: Ch 1, sc in same st, *ch 2, sc in next st, ch 2, sk 1 st, sc in next st, repeat from * around. sl st to 1st sc. Rnd 3: In a corner ch 2 sp (see video tutorial for specific location): *Ch 3, 3DC in same sp, ch 3, sl st in same sp, 2sc in next ch 2 sp, sl into next ch sp, repeat from * around, sl st to beg. ch of beg. ch up 3. Rnd 4: Sl st around the beg. ch up 3 from prev. round: Ch 1, 3 sc around beg. ch 3. *HDC in next 3 sts, 3sc around next ch 3, ch 2, 3 sc around next ch up 3, repeat from * around, sl st to 1st sc. Fasten off. Rnd 5: In any 1st sc of 2sc grouping from round 3: *Ch 4, sl st in next sc, ch 5, sl st in next sc, repeat from * around, sl st to 1st ch of beg. ch 4. Rnd 6: In ch 4 sp on side: Ch 1, *[SC, HDC, DC, Picot, DC, HDC, SC] in ch 4 sp, [3sc, ch 2, sc] in ch 5 sp, repeat from * around. sl st to 1st sc of this round. Fasten off. Rnd 7: In corner ch 2 sp: Ch 4, [TR, ch 2, 2 TR] in same corner sp, *Sk 1 st, TR in next, Ch 1, SC in picot, Ch 1, SK next 4 sts, TR in next, SK 1 st, [2TR, ch 2, 2 TR] in corner, repeat from * around, sl st to beg. ch up 4. Rnd 8: In any corner: Ch 1, *sc in corner, FPDTR around middle DC of petal from round 3, ch 2, FPDTR around middle DC of petal again, SC in same corner on round 7, sc in next 3 sts, sc in ch 1 sp, DTR in skipped st from round 1, sc in ch 1 sp and in next 3 sts, repeat from * around. Sl st to beg. sc. Rnd 9: In any corner: Ch 3 (counts as DC) [DC, ch 2, 2 DC] in same corner sp, *DC in each st on side, [2DC, ch 2, 2DC] in corner, repeat from * around, sl st to beg. ch up 3. Fasten off. Weave in all ends. Like this Granny Square? Try Making the Hello, Sunshine Granny Square! I created this In Full Bloom Granny Square design to add to our 365 Days of Granny Squares project. It uses variety of crochet stitches including crocodile stitches to create an interesting floral design! I hope you enjoy making your square! Rnd 4: In ch sp on the side (see video tutorial for specific location): *[Ch 1, 3DC, sl st, 3DC, sl st, 3DC, sl st] in ch sp, sl st in next ch sp, SC in same ch sp, sl st into next ch sp, repeat from * around sl st to beg ch sp and sl st to 1st sc. Rnd 6: In any ch 4 sp: Ch up 3, 5 DC in same sp, *6 DC in next sp, ch 3, 6 DC in next sp, Repeat from * around, ending with ch 3, sl st to beg ch 3. Fasten off. Rnd 7: Starting at the bottom of a DC before a ch 3 sp: *Crocodile Stitch, ch 1, sk 3 sts, Crocodile Stitch, ch 1, sk 3 sts, Crocodile Stitch, SC in DC from Round 5, repeat from * around, sl st to beg. ch up 3. Rnd 9: In any corner: Ch 1, *[3sc, ch 2, 3sc] in corner, sc in next st, sc in next st pinning down crocodile st from round 7, sc in next 5 sts, sc in next pinning down crocodile st, sc in next 6 sts, sc in next pinning down crocodile st, sc in next st, repeat from * around, sl st to beg. sc. I created this Wrinkled Rose Granny Square design to add to our 365 Days of Granny Squares project. It uses variety of crochet stitches to create an interesting 3-D design! I hope you enjoy making your square! Rnd 1: Ch up 3 (counts as DC), TR in ring, DC in ring, Ch 2, [DC, TR, DC, Ch 2] 3 times, sl st to beg. Rnd 2: In any ch 2 sp: Ch 1, sc in same sp, *3DC in next st, FPSC around TR, 3DC in next st, [SC, CH 2, SC] in corner, repeat from * around ending with sc, ch 2 in beg. corner, sl st to 1st sc. Rnd 3: In any FPSC: Ch 3 (counts as DC), DC in same st, *2TC in each of the next 3 sts, TC in next st, SK ch sp, TC in net st, TC in previous st again (X-made), TC in same st after ch sp, (see video tutorial for visual instructions), 2 TC in each of the next 3 sts, [2DC, CH 2, 2DC] in FPSC, repeat from * around ending with 2 DC, ch 2, sl st to beg. Fasten off. Work behind work for Round 4. Rnd 4: In any Skipped ch 2 sp from Round 2: Ch 3 (counts as DC), [DC ch 2, 2 DC] in same sp, *Ch 5, [2DC, ch 2, 2 DC] in next corner sp, repeat from * around, sl st to beg. Rnd 5: In Corner, Ch 3 (counts as DC), Make an X-Stitch tacking down the Treble-X from the Petal on the Flower (see video tutorial for visual instructions), DC in same ch sp from round 4’s corner, DC in next 2 sts, *6 DC in ch sp, DC in corner, X-Stitch tacking down the Treble-X from the petal on the flower, DC in same corner, DC in next 2 sts, repeat from * around, sl st to beg. Rnd 7: DC in each st around putting [DC, ch 2, DC] in corners. Sl st to beginning, Fasten off. I created this Charming Chain Granny Square design to add to our 365 Days of Granny Squares project. It uses variety of crochet stitches to create an interesting design using a lot of chains! I hope you enjoy making your square! -The finished square measures 6 inches. Rnd 1:Ch 4, sl st to 1st ch to form a ring, ch 1, (sc, ch 2) 4 times in ring, sl st to beginning sc and sl st into ch 2 sp. Rnd 2: Ch up 1, [sc, ch 2, sc] in same sp, * ch 2, [sc, ch 2, sc] in next ch sp, repeat from * around, sl st to 1st sc. Sl st into ch sp. Rnd 3: Ch 1, turn, sc in same sp, * ch 3, [sc, ch 2, sc] in corner, repeat from * around, sl st to beg. sc. Turn. Rnd 4: In corner, Ch 1, *[SC, ch 2, SC] in corner, Ch 2, DC in SC from Rnd 1, Ch 2, Repeat from * around, sl st to beg. sc. Rnd 5: In Corner, Ch 1, *[SC, ch 2, SC] in corner, Ch 7, Repeat from * around, sl st to beg sc. Rnd 6: Sl st into corner, Turn, SC in same corner, * Ch 9 ,[SC, ch 2, SC] in corner, repeat from * ending with SC, ch 2 in corner, sl st to beg sc. turn. Rnd 7: Sl st into corner, Ch 1, * [SC, Ch 2, SC] in corner, ch 11, repeat from * around, sl st to 1st sc. Rnd 8: In corner, Ch 1, *[SC, ch 2, SC] in corner, ch 6, DC in DC from rnd 4, Ch 6, repeat from * around, sl st to beg. sc. Rnd 9: In corner, Ch 5 (counts as DC + Ch 2 sp), DC in same sp, *Sk sc, sc in 1st ch, sk 1 ch, shell in next ch, sk 1 ch, sc in next ch, sk 1 ch, shell in DC, sk 1 ch, sc in next ch, sk 1 ch, shell in next ch, sk 1 ch, sc in last ch, sk sc, [DC, ch 2, DC] in corner, repeat from * around, sl st to 3rd ch of beg. ch 5. Rnd 10: In corner, ch 5, DC in same sp, *[ ch 2, HDC in sc, ch 2, sc in middle dc of shell] 3 times, ch 2, HDC in sc, ch 2, [DC, ch 2, DC] in corner, repeat from * around, sl st to 3rd ch of beg. ch 5. Rnd 11: In corner, ch 3, [DC, ch 2, 2 DC] in same sp, 2 DC in each ch sp, [2DC, ch 2, 2DC] in corners, sl st to beg. I created this Flower Bunch Granny Square design to add to our 365 Days of Granny Squares project. It uses variety of crochet stitches to create a garden-like look with the flowers in the round! I hope you enjoy making your square! Cluster: YO, insert hook, YO pull through, YO pull through 2, YO, insert hook, YO pull through, YO pull through 2, YO, insert hook, YO pull through, YO pull through 2, YO pull through all 4 loops on hook. Cluster made. Rnd 3: Start in a st before a stem, (See video tutorial for placement), Ch 6 (counts as dc + ch 3), sk over flower stem, DC in next 8 sts, *ch 3, DC in next 8 sts, working behind flowers, repeat from * around, ending with DC in last 7 sts, sl st to 3rd ch of beg. ch 6. Rnd 4: In corner, Ch 1, *[3 sc, ch 2, 3 sc] in corner, sc in next 4 sts, ch 5, 10 sc in 2nd ch from hook, sl st to 1st sc, ch 1, 3sc in same st, (sl st to next st, 3 sc in next st) 4 times. sl st to beg petal, sc down the 3 chs of the stem, sc in next 4 sts, repeat from * around. sl st to beg. sc. Rnd 6: In any corner, ch 3, [DC, ch 2, 2 DC] in same corner, *[sk st, dc in next, dc in sk’d st] repeat until you get to next corner, [2 dc, ch 2, 2 dc] in next corner, repeat from * around. sl st to beg. ch up 3. Make French knots in the center of your flowers and tack them down. See video tutorial for visual instructions. I created this Cornershop Granny Square design to add to our 365 Days of Granny Squares project. It uses variety of crochet stitches to create a look with popping corners! I hope you enjoy making your square! Rnd 2: In any ch 1 sp between popcorn sts, ch 5 (counts as DC + ch 2 sps), DC in same sp, *ch 2, FPDC around DC from rnd 1, ch 2, [DC, ch 2, DC] in ch 1 sp between popcorns, repeat from * around, sl st to 3rd ch of beg. ch 5. Rnd 3: In corner, Ch up 4, *[Cluster, ch 1] 2 times in next sp, [Cluster, ch 1] 2 times in next sp, [DC, ch 2, DC] in corner, repeat from * around, sl st to 3rd ch of beg ch 4. Rnd 4: In corner, ch up 4, *Popcorn in ch 1 sp, ch 1, DC in next st, DC in ch 1 sp, DC in cluster, DC in ch 1 sp, DC in cluster, DC in ch 1 sp, DC in cluster, Ch 1, Popcorn in next ch 1 sp, Ch 1, [DC, ch 2, DC] in next corner, Ch 1, repeat from * around, sl st to 3rd ch of beg. ch 4. Rnd 5: In any corner, ch up 3, [1DC, ch 2, 2 DC] in same corner, *2DC in next ch sp before popcorn, sk popcorn st, DC in next 7 sts, Sk popcorn st, 2 DC in ch 1 sp, [2DC, ch 2, 2 DC] in corner, repeat from * around. Sl st to beg. ch up 3. I created this Dazzling Dragonfly Granny Square design to add to our 365 Days of Granny Squares project. It uses variety of crochet stitches to create a look of a 3D Dragonfly! I hope you enjoy making your square! Beg. TR Popcorn: ch up 3, 4 DC in same st, remove hook from loop, insert hook in 1st st, put loop back on hook and pull through. ch up 4, 5 DC in same st, remove hook from loop, insert hook in 1st st, put loop back on hook and pull through. Rnd 1: Beg. Popcorn in ring, ch 2, 3DC in ring, ch 2, DC in ring, CH 11, sc in 2nd ch from hook and in next 4 sts, HDC in rest of the chs, 3 HDC in last ch and make a popcorn st (see video tutorial to see how to do that), DC back into ring, ch 2, 3 DC in ring, ch 2, Sl st to beg. popcorn. Rnd 2: Beg. Popcorn in popcorn, ch 2, Dc in ch 2 sp, DC in the next st, [2dc, ch 2, 2dc] in next st, dc in next st, DC in ch 2 sp, sk dc, [2DTR, ch 2, 2DTR] in center ring (working behind the dragonfly tail), dc in ch 2 sp, DC in next st, [2dc, ch 2, 2dc] in next st, dc in next st, 2 dc in ch sp, ch 2, sl st to beg. popcorn. Rnd 3: Beg. Popcorn in popcorn, ch 2, DC in ch sp, dc in next 4 sts, [DC, ch 3, DC] in corner, DC in next 6 sts, [dc, ch 3, dc] in corner, dc in next 6 sts, [dc, ch 3, dc] in corner, dc in next 6 sts, dc in ch sp, ch 2, sl st to popcorn. Rnd 4: Beg. TR Popcorn in popcorn st, ch 2, dc in ch sp, dc in next 6 sts [DC, ch 3, DC] in corner, dc in next 8 sts, [dc, ch 3, dc] in corner, dc in next 8 sts, [dc, ch 3, dc] in corner, dc in next 8 sts, ch 2, sl st to beg. tr popcorn. Rnd 5: Ch 3, [DC, ch 2, 2 dc] in same popcorn st, DC in next 8 sts, [2 DC, ch 3, 1 DC] in corner, DC in next 10 sts, [2 DC, ch 3, 1 DC] in next corner, DC in next 10 sts, [1 DC, ch 3, 1 DC] in next corner, DC in next 10 sts, Sl st to beg ch up 3. Rnd 6: DC in each st around putting [2 DC, ch 2, 2 DC] in each corner. Rnd 7:Sc in each st around, [2 sc, ch 2, 2 sc] in each corner. Sl st to beginning. Right side: Ch 8, DC in 3rd ch from hook, DC in next, HDC in next, SC in the rest of the chs, sl st back into body of dragonfly, ch 10, TR in 4th ch from hook, DC in next 2 sts, HDC in next, SC in the rest of the sts, sl st back onto body of dragonfly, fasten off, Sew wings down flat. ch 10, TR in 4th ch from hook, DC in next 2 sts, HDC in next, SC in the rest of the sts, sl st back onto body of dragonfly, Ch 8, DC in 3rd ch from hook, DC in next, HDC in next, SC in the rest of the chs, sl st back into body of dragonfly, fasten off, Sew wings down flat. I created this Floral Palisade Granny Square design to add to our 365 Days of Granny Squares project. It uses variety of crochet stitches to create a look that reminds me of a gate into a beautiful garden! I hope you enjoy making your square! Beg cluster: YO, Insert Hook, YO pull through, YO, pull through 2 loops, YO, insert hook, YO Pull through, YO pull through 2 loops, YO pull through 3 loops on hook. Cluster: [YO, Insert Hook, YO pull through, YO, pull through 2 loops] 3 times, YO pull through all 4 loops on hook. Rnd 1: Ch 3 (counts as DC), DC in ring, ch 2, (2DC, ch 2) 7 times in ring. Sl st to beginning. Rnd 2: In any ch sp, ch 2, Beg. Cluster in same sp, ch 3, * cluster in next sp, ch 3, repeat from * around, sl st to beg. cluster. Rnd 3: In any ch 3 sp, ch 1, [sc, hdc, dc, tc, picot, tc, dc, hdc, sc] in each ch sp, sl st to beg. sc. (8 petals made) Fasten off. Rnd 4: In any picot, ch 1, sc in same sp, *ch 6, sc in next picot, repeat from * around. Sl st to beg. sc. Rnd 5: In ch 6 sp, Ch 3 (counts as dc) 5 DC in same sp, *(6DC, Ch 2, 6DC) in next sp (Corner made), 6 DC in next sp, repeat from * around, sl st to beg ch up 3. Rnd 6: In any corner, Ch 1, *[sc, ch 2, sc] in corner, sc in next 3 sts on round 5, DTR in DC from Previous Petal from Round 3, SC in next 5 sts on round 5, DTR in DC from next petal from round 3, SC in next 2 sts on rnd 5, DTR in Previous Petal from round 3, SC in next 5 sts from rnd 5, DTR in DC from next petal from Rnd 3, SC in next 3 sts from rnd 5, repeat from * around, sl st to first sc of this round. Rnd 7:Sc in each st around, [sc, ch 2, sc] in each corner. Sl st to beginning. I created this Celestial Delight Granny Square design to add to our 365 Days of Granny Squares project. It uses variety of crochet stitches to create a look that reminds me of wild stars in the universe! I hope you enjoy making your square! -The finished square measures 8 inches. Rnd 5: At the base of any point, ch 1, sc in same st, sc in next 5 sts, *[sc, ch 3, sc] in top of point, sc in next 6 sts, sc3tog over [sl st, sc, and sl st], sc in the next 6 sts, repeat from * around, ending with sc3tog. sl st to beginning sc. fasten off. Rnd 6: In any ch 3 sp at the top of a point: Ch 3, [DC, ch 2, 2 DC] in same sp, sk 1, * DC in next, Sk 1, TR in next, Sk 1, DTR in next, Sk 1, TTR in next, Sk 1, DTR in next, Sk 1, TR in next, Sk 1, DC in next, sk 1, sc in ch 3 sp, sk 1, repeat from * around. Rnd 7: In any corner, Ch 3, [dc, ch 2, 2 dc] in same sp, *HDC in next st, SC in next, HDC in next, DC in next 2 sts, TC in next, DC in next, HDC in next, SC in next 3 sts, HDC in next, DC in next, TC in next, DC in next 2 sts, HDC in next, SC in next, HDC in next, [2dc, ch 2, 2dc] in corner, repeat from * around. Sl st to ch up 3. Rnd 8: SC in each st around putting [sc, ch 2, sc] in corners. I created this Blooming Daydreams Granny Square design to add to our 365 Days of Granny Squares project. It uses variety of crochet stitches to create a look that reminds me of summer! I hope you enjoy making your square! -The finished square measures 7 inches, but you can stop at any round to make this smaller, or you can continue on to make it larger just repeating the last few rounds. Rounds 11-22 Can be found here, to make your square larger.